PAINT 30 watercolors in 30 days, from June 1-30 2018. 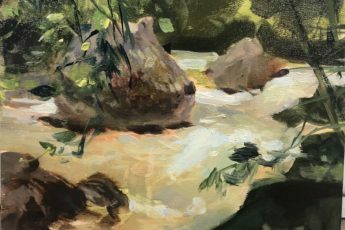 POST your paintings in our new Facebook group. We’d like to centralize the discussion around this group, to spare our usual sketching clubs all the extra traffic this might create. 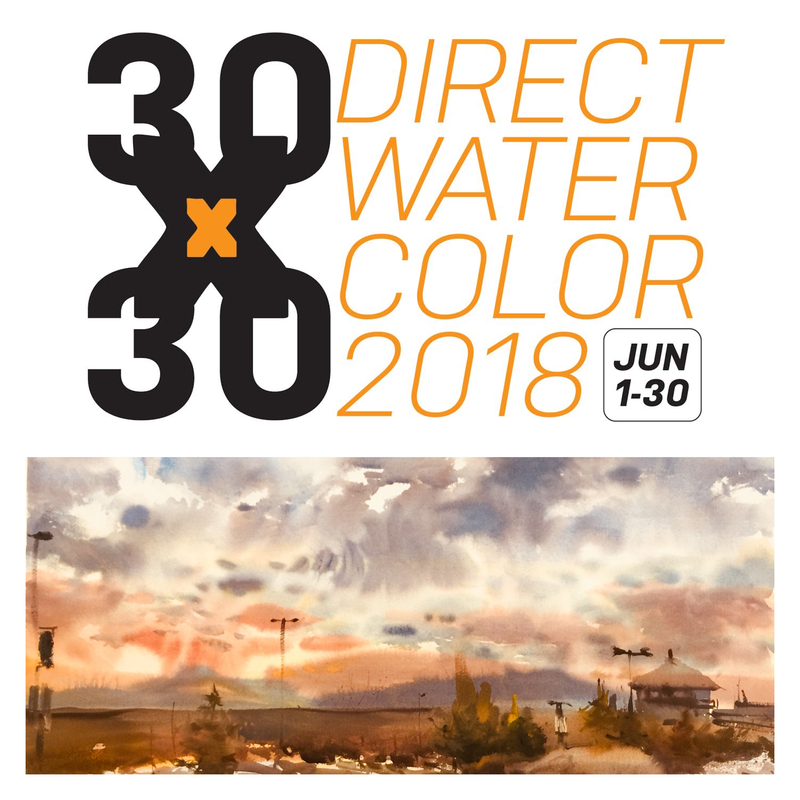 HASHTAG your work on any other social media (twitter, instagram) with the hashtag: #30x30DirectWatercolor2018. This will help people find your work in the future. Here are some FAQs on how to use hashtags: FB | IG | Twitter. Any size, format or subject is ok. I personally hope to paint on location, but it’s going to depend on weather and the situation at home. I plan to paint in watercolor, working as directly as possible. But if you want to tint drawings, or add in some mixed media, we’re not going to be enforcing rules. I won’t however, have a lot of advice about techniques I’m not thinking about this month. Our goal is experiencing sustained daily practice. If it’s better for you to do seven paintings on the weekend instead of one a day, that’s totally ok. Same with posting progress. One a day makes a good story – but do what works for you. It’s also completely normal if you fail to make 30! Or to need a few extra days. Like any marathon, just participating is the first reward. 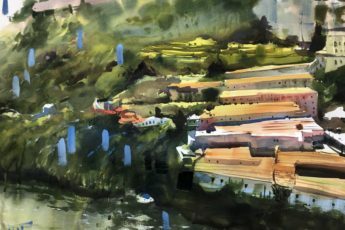 Marc Taro Holmes, a Canadian watercolorist and author of a new book, Direct Watercolor set up this challenge along with 5 of his friends to sustain practice and get in shape for the next level in painting. Whatever level each artist is at and where she/he intends to take it, that is. Marc’s super informative website is here. Joined in this madness are his friends from all over the world. Each of the following five artists will be super active for one week in June, supporting the community, giving feedback and just being there on our Facebook group as we collectively grow. 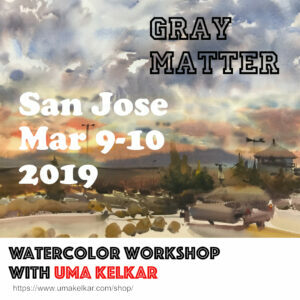 Uma Kelkar (you know my website!) and Suhita Shirodkar are from San Jose, USA. If you want to see lucid figures done with confidence, head over to Suhita’s website here! Anne-Laure Jacquart is a French vlogger and super enthusiastic artist who travels and teaches world wide. Her youtube channel is much followed. Liz Steel from Australia is truly a force behind worldwide artists’ community and a popular teacher. She needs the least introduction to people who have sketched and been engaged in online community before this challenge. Her website with chockfull advice and lessons is here. American artist Maria Coryell-Martin is, in my vocabulary, an extreme artist – an artist who paints under extreme weather conditions. She also design compact travel palettes on her website. To this team, as of today, about 1400+ other artists from all over the world have committed to the 30×30 challenge. And it all begins in 2 days. 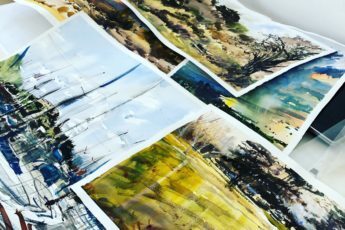 See what a collective effort makes you do – see yourself trounce your struggles and cheer others along to see them conquer their latest fears in watercolors. We all know we dread the white paper at one point of time or the other. I will post interviews of each of the above artists in subsequent posts. Stay tuned! Direct watercolor is challenging indeed and also can be addicting!! !